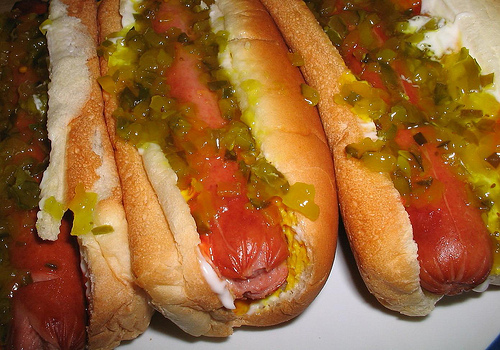 Food Costs > How Much Do Hot Dog Buns Cost? How Much Do Hot Dog Buns Cost? Hot dog buns, the type of bread specially designed to hold a hot dog, will contain the hot dog itself and generally the condiments that go along with it. The cost of hot dog buns will really depend on the brand and the store you purchase it from. How much does a pack of hot dog buns cost? Overall, plan on spending anywhere from $1 to $5 for a pack of 8 to 12 buns. A freshly made package of hot dog buns, commonly found in the deli section at a grocery store or bakery, will cost about $3 to $5 per eight-pack, whereas your more popular processed buns coming from name brand companies will cost less than $3. According to the comparison between Walmart and Target made by Cockeyed.com, the price of an 8 pack of hot dog buns costs about $2. The price fluctuates, as mentioned, depending on its brand and where you purchase it. At Sam’s Club, for example, the cost of a 24-count pack will be in the $3 to $4 range. At Whole Foods Market, the average pack retails for $3 to $5. For example, a six-pack of the store-branded organic white buns retail for $4, while a six-pack of Ezekiel sprouted grain bread retails for $5. The brand of the hot dog buns matters. If you are to buy well-known buns, then you will probably spend more than a store brand. Hot dog buns are more than just bread, and the prices can vary on the type of bun you buy. Potato buns with healthier ingredients, for example, might cost more than a processed store brand. The same can be said about a bakery selling a fresh batch of buns. Pay close attention to the “sell-by” or” use by” date printed on the package of hot dog buns. If you are not able to use all the hot dog buns by the date printed on the package, you can freeze the remaining ones. Just take them out of the freezer an hour or two before using them. Hot dog buns often come in packs of eight or 12, but at wholesale clubs, you may be able to find packs of 24 or more. Since hot dogs are also purchased in groups of eight, an eight pack is usually your best option. Most hot dog buns, unless specified, will be able to accommodate a six-inch hot dog. Consider a nearby bakery rather than your local grocery store. Bakeries offer lower prices than the ones offered in the grocery stores. Plus, the freshness will taste a lot better than hot dog buns sitting on the shelf for days. This is a common item that is always on sale, especially during the summer holidays such as the Fourth of July. If you are not loyal to store brands, consider testing them. These store brands tend to be the brands that are less than $2. As with any food product, the more that you purchase at once, the more you can save. Consider making your own hot dog buns for pennies. Just like making homemade bread, the only ingredients you will need will include milk, water, butter and flour.